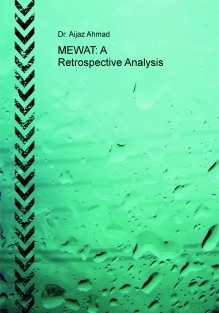 This book Mewat: A Retrospective Analysis is a brief account of the Mewat area, its people and history. It also includes the origin, custom, and traditions of the Meo community which are to many extent different from the other communities of India. It is rather mysterious for the readers to know that these people of the unique culture and civilization reside in the National Capital Region or the suburb of Delhi, the national capital of India. The author gives the full detail of the origin of this aboriginal Meo tribe also throws light on their acceptance of Islam. In this book the author has covered the period from the Muslim invasion in India until the British period when the Mewati people proved their bravery during the First War of Independence. Some periods of the freedom movement also have been covered. The vast period which has been written in this book witness the details of the Mewatis as rulers and as subject. Their relations with the Delhi rulers like Ilbaris, Tughtaqs, Sayyeds, Lodis and Mughals including the British in modern times has also been discussed in detail. The whole chapters are written in such a way that the reader will be informed of all important aspects of the Mewati history. This book resembles the complete history of Mewat composed of both the original sources and heterogeneous materials with the proper application of the hypothesis.